It always amazes me that the nuclear power business is just a beard for nuclear weapons. Nuclear weapons are a thing of the past, but no one can admit it. Thus the amazing charges in this case. What about the lax security measures? That is where the prosecution should start. Right now we are involved in the largest war games ever held in the middle east in Jordan with 20 or so other nations participating. Isn’t that grand? And to top it off the President of Israel thinks the plan is worked out. This is so wrong in so many ways I lost count at 100. What a pitiful waste for so much promise in Obama. The U.S. ambassador to Israel, Daniel Shaprio, told a closed conference in Tel Aviv that the United States has completed preparations for a military strike on Iran. His comments were recorded by a reporter and aired on Israel’s Channel 2 TV on Wednesday night. Shaprio’s comments were not intended for public consumption, the Times of Israel reports. I wanted to end the year with something positive like I did the Friday before Christmas. But this has been a meditation on national environmental events and it would be impossible no matter what the topic to not post about this. I mean how inept must you be to erect a WOOD scaffolding in a shipyard let alone one around a rubber coated nuclear submarine. A shipyard where they do things like weld, work with rivets and cut steel. How could they not start a fire. The good news is that no exterior fire is ever going to get inside an nuclear submarine. The bad news is that the rubber is probably filled with top secret exotic toxic materials which could kill or sicken the workers and people who live in nearby towns. Welcome to 2012 everyone. Jan M. Olsen contributed to this report from Copenhagen. MOSCOW — Firefighters extinguished a massive fire aboard a docked Russian nuclear submarine Friday as some crew members remained inside, officials said, assuring that there was no radiation leak and that the vessel’s nuclear-tipped missiles were not on board. The fire broke out Thursday at an Arctic shipyard outside the northwestern Russian city of Murmansk where the submarine Yekaterinburg was in dry-dock. The blaze, which shot orange flames high into the air through the night, was put out Friday afternoon and firefighters continued to spray the vessel with water to cool it down, Emergency Situations Minister Sergei Shoigu said. Konashenkov’s statement left it unclear whether the crew were trapped there or ordered to stay inside. Go there and read. More next year. You know, it is really hard to have fun with a nuclear disaster. You have heard the phrase of course, digging a hole to China. It became a popular phrase in the late 1880s because China was so far away and exotic and because it is on the “opposite side of the world”. However as this vido points out that phrase is spectacularly wrong. So a nuclear disaster here in the US would actually amount to a St. Paul syndrome and a nuclear disaster in Japan would amount to a Falklands syndrome. Every since the discussion about what would happen if a nuclear reactor core got out of its containment and of course the wildly popular but who knows how true to real life movie “China Syndrome”, I’ve had serious doubts. The first premise is that the reactor core is “running” when it breaches the power station. The second premise is that it would tunnel down to the Earth’s magma. The third premise is that would somehow amount to an explosion that would end the world. Comon. Even in pristine imaginary terms that probably does not happen. First that is a lot of bedrock to eat through and the reactor still maintain its symmetry. No symmetry no nuclear reaction. Second if it hit the magma, it would lead to a volcanic eruption but we have those all the time. Am I saying it would be a good thing. NO. I just got doubts. These 2 authors think otherwise. Though when I read the article it seemed like her editors had merge 2 computer files to make for a very confusing piece. And this guy who quotes other sources. Both pieces are really long so you will have to go there and read them. More tomorrow. Please play this song in the background. It is kind of a return to our old Jam Band Friday format. Anyway crossing the boundaries between green transportation, energy policy and crowd control, the Germans announced they had come to an agreement to sell Saudia Arabia 200 of their Leopard 2A1 battle main tanks. As Der Speigel quickly pointed out such a sale sends both a crazy signal to Germany’s large peace community but a defeatist one to those countries involved in the Arab Spring (read: food riots). But when it comes to crushing resistance any battle main usually weighs over 50 ton, so that works out pretty well. Do not be fooled either by the nameless chinese man’s dance with the Chinese battle main because that was a once in a century event. The Arab drivers prefer to get them babies up to their top speeds of 45 miles per hour and roll. At those speeds they get a whopping 1.3333 miles per gallon. But at more cautious battle speeds they get something more like 4 – 5 miles per gallon. Kinda like a 1963 red corvette. Or maybe a Hummer. But when you compare it to its actual soul mates like the Caterpillar 797 which gets a heart pumping 3 miles per gallon at the same speeds the Leopard is a true jungle cat. OK well I have had enough fun for today. Should Germany Sell Tanks to Saudi Arabia? Troops of the 37th Armored Infantry Brigade (37. Panzergrenadierbrigade) prepare to board their Marder light tanks. News of the deal broke on Sunday, when the newsweekly Der Spiegel reported that Germany’s ultra-secretive Federal Security Council, whose members include Merkel, Foreign Minister Guido Westerwelle, and Defense Minister Thomas De Maiziere, approved the sale of 200 Leopard 2 tanks, Germany’s most modern battlefield tank, to Saudi Arabia. During a meeting of the CDU parliamentary group on Monday, Norbert Lammert, the president of the Bundestag — the German parliament — and Ruprecht Polenz, head of parliament’s influential foreign affairs committee, argued forcefully that Germany could not sell such heavy arms to a country known for routine violations of the most basic human rights. “Such decisions cannot be taken at a time when people are fighting for democracy in the Arab world,” said Juergen Trittin, a Green Party leader, on German television on Tuesday. Protests have also been raining in from church leaders and human-rights activists, who argue that Saudi Arabia is on the wrong side of history in the tide of rebellion sweeping through the Arab world. As the momentum of protests in Tunisia and Egypt carried the Arab Spring into the tiny nation of Bahrain last March, some 2,000 troops from Arab nations close to the ruling monarchy, including heavily armed Saudis, quashed the rebellion. Meanwhile, the German government still faces criticism for abstaining from the U.N. Security Council vote authorizing air strikes in support of Libyan rebels, and still refuses to offer direct military aid, even after softening its position (it does provide about $5.3 million in financial assistance for NATO’s Libya mission.) Against that backdrop, even Merkel’s closest party allies are at a loss to justify the sale of weapons to a nation with a history of oppression. The deal, were it to take place, is stunning not only because of the political signal it sends to pro-democracy activists in the Middle East and North Africa. 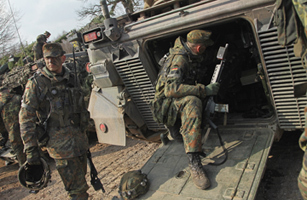 A weapons sale of that order would mark a significant change in German arms-export policies. For the past 20 years, Germany has refused to sell such heavy artillery to the Saudis, citing concerns over human-rights abuses. German law also forbids weapons exports to countries engaged in a direct conflict — though the definition of conflict is open to interpretation. The Leopard 2 tank is manufactured in Germany but is also produced under license in Spain. And the Saudis are believed to have also negotiated with the Spanish, putting Madrid and Berlin in competition for defense jobs. Germany has a small army and with the end of the Cold War there is little requirement for tanks like the Leopard 2 on potential European battlefields. NATO is scaling back its traditional European land defenses in favor of lighter, rapid deployment forces to support campaigns out of the European theater, such as Afghanistan. The shrinking demand at home leaves defense companies looking abroad for contracts. The Leopard 2E (E stands for España, Spanish for Spain) is a variant of the German Leopard 2 main battle tank, tailored to the requirements of the Spanish Army, which acquired it as part of an armament modernization program named Programa Coraza, or Program Armor. The acquisition program for the Leopard 2E began in 1994, five years after the cancellation of the Lince tank program that culminated in an agreement to transfer 108 Leopard 2A4s to the Spanish Army in 1998 and started the local production of the Leopard 2E in December 2003. Despite postponement of production due to the 2003 merger between Santa Bárbara Sistemas and General Dynamics and continued fabrication issues between 2006 and 2007, 219 Leopard 2Es have been delivered to the Spanish Army. The Leopard 2E is a major improvement over the M60 Patton tank, which it replaced in Spain’s mechanized and armored units. Its development represented a total of 2.6 million hours worth of work, 9,600 of them in Germany, at a total cost of 1.9 billion euros. This makes it one of the most expensive Leopard 2s built. Indigenous production amounted to 60% and the vehicles were assembled locally at Sevilla by Santa Bárbara Sistemas. It has thicker armor on the turret and glacis plate than the German Leopard 2A6, and uses a Spanish-designed tank command and control system, similar to the one fitted in German Leopard 2s. The Leopard 2E is expected to remain in service until 2025. Gets better mileage then the Space Shuttle, which “leapt from the ground like a scared cat” today for the last time. God speed. More next week. When are we going to admit that we are sitting on a time bomb. Nuclear power was always a dumb idea…though pushed in part by rocket scientists…and now it is a plague. How else do you explain my waking up to these 2 headlines on the same day? SANTA FE, N.M., June 28 (Reuters) – New Mexico officials raced on Tuesday to bring in more fire crews and equipment including radiation monitors as an out-of-control wildfire raged near the preeminent U.S. nuclear weapons laboratory. Firefighters managed to keep flames off Los Alamos National Laboratory property throughout the night on Monday as the blaze continued to grow, reaching 60,741 acres (24,580 hectares), said Lawrence Lujan, a spokesman for the Santa Fe National Forest. The laboratory will remain closed on Tuesday and Wednesday due to fire danger, lab spokesman Kevin Roark told Reuters. Fire officials said the so-called Las Conchas blaze had the potential to double or triple in size. Several towns are under mandatory evacuation, including the nearby city of Los Alamos, with a population of around 12,000. Los Alamos National Laboratory was established at the end of World War II to house the top secret Manhattan Project to build the first atomic bomb. It still serves as home to the nation’s largest nuclear weapons cache. Please read more but it will scare you to death how close to an actual disaster we came. Is this one in the making? Because of residents’ worry of a nuclear disaster, rumors about the true conditions of the two plants circulate in the state. The rising Missouri River flood water continues to threaten the two power plants in Nebraska. To assess the situation, the U.S. Nuclear Regulatory Commission Chairman Gregory Jaczko visited the Fort Calhoun plant on Monday morning. The Fort Calhoun Nuclear Station, located 20 miles north of Omaha, is one of the two nuclear plants in the state being monitored by the NRC because of the threats of inundation from the Missouri River. The Fort Calhoun plant has been closed since April for refueling. Its parking lot is flooded, plant employees need to walk on a catwalk to reach the facility. An inflatable water-filled barrier that surrounds the plant was punctured by machinery on Sunday, but the plant operators assured residents that key areas of the facility are not in danger of submersion. However, plant employees briefly switched to diesel backup generators to keep the nuclear fuel at the site cool because the flood water got too close to electrical transformers. The other plant, Cooper Nuclear Station, is on higher ground and continues to operate. However, reports said the station is close to shutting down because flood water had reached critical levels. The rumors include an alleged two-mile radius no-fly zone declared by the Federal Aviation Administration on the air space around Fort Calhoun because of a radiation leak and the declaration of a Level 4 emergency at the facility. The plant operators denied the reports. Did I mention that there now appears to be water leaking into the basement of the facility. More tomorrow if we are still alive.